Each one of us, as sons of God, can fulfill our mission and destiny. My beloved brethren of the priesthood, as I begin, I would like to direct my remarks to each 12-year-old deacon attending this general priesthood session. Wherever you are, I want to acknowledge your presence and to tell or remind you of the experience that President Gordon B. Hinckley had when he was, like you are, a 12-year-old deacon. Even as that experience had by President Hinckley as a 12-year-old deacon was “one he would remember for the rest of his life,”2 I pray that the experience you are having will be one you will remember for the rest of your lives. Now, I invite us all to look at this remarkable cast bronze sculpture entitled Deacons’ Bench. For those of you who cannot see it, Deacons’ Bench is the likeness of five deacons, caught in a candid moment while seated on a bench in church. As you look at these five deacons, what do you see? Now, as I read statements by two former Presidents of the Church, I will ask the question a little differently: what can you see? In light of these prophetic declarations, if we expand our vision beyond five deacons on a bench to include all of the young men of the Aaronic Priesthood, then what can you see? I trust and pray that we can all see their divine potential; that we can see them going forth as bearers of the holy priesthood and as missionaries preaching “the everlasting gospel”5 by the Spirit6 “to the nations of the earth”;7 that we can see them as faithful husbands and fathers and as valiant servants in and leaders of the Church and kingdom of God in these latter days. Who was this 12-year-old boy? What was His mission and destiny? And how was He able to fulfill it? “When ye have lifted up the Son of man, then shall ye know that I am he, and that I do nothing of myself; but as my Father hath taught me, I speak these things. 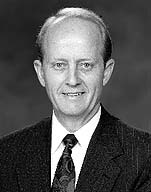 I so testify, as I also bear my witness that President Thomas S. Monson is indeed a prophet of God and that he and his counselors in the First Presidency and the Quorum of the Twelve Apostles are prophets, seers, and revelators, in the sacred name of Jesus Christ, amen. In Sheri Dew, Go Forward with Faith: The Biography of Gordon B. Hinckley (1996), 35–36. In “President Gordon B. Hinckley,” In Memoriam: President Gordon B. Hinckley, 1910–2008 (a supplement to the Liahona, Apr. 2008, 3; a supplement to the Ensign, Mar. 2008, 3). In Conference Report, Apr. 1970, 6. “Boys Need Heroes Close By,” Ensign, May 1976, 45. Revelation 14:6; D&C 68:1; see also D&C 133:7–8. See Matthew 10:19–20; Luke 24:32; D&C 42:14; 43:15; 50:13–22; 84:85. D&C 134:12; see also Revelation 14:6; D&C 68:8; 133:7–8. See Matthew 16:16; 2 Nephi 25:19–20; Mosiah 3:8; 4:2; Alma 5:48; Helaman 5:9; 3 Nephi 5:13; 11:10–11; 20:31; D&C 14:9; 68:6. Mosiah 3:9; see also Mosiah 3:12; D&C 18:17–19, 21–25. Joseph Smith Translation, Matthew 3:24. 2 Nephi 2:18; Ether 8:25; Moses 4:4. Helaman 6:30; see also Mosiah 4:14. Psalm 82:6; Hosea 1:10; Romans 8:16–17; Hebrews 12:9; D&C 11:30; 35:2; Moses 6:68. D&C 93:1, 19; see also John 14:6; D&C 76:92–95; 2 Nephi 31:7–16; 3 Nephi 12:48; 27:27; Moroni 10:32–33.